TheBlueGuerilla: EXCLUSIVE: Former Tory Youth Leader Ben Howlett Backs Lord Feldman and Slams Lost Loyalties. 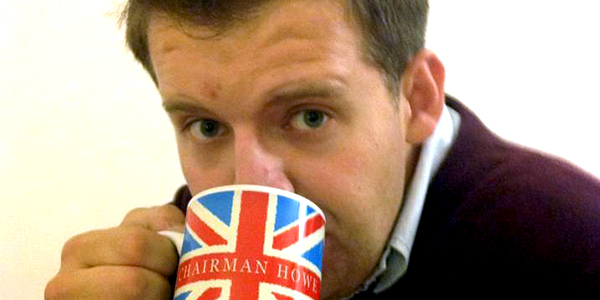 EXCLUSIVE: Former Tory Youth Leader Ben Howlett Backs Lord Feldman and Slams Lost Loyalties. MODERNISATION of the Tory Party is taking real effect as of late and is upsetting some in the press & Party as they ache for a UKIP type lurch and try to trash Prime Minister David Cameron & his allies in No.10. Whilst the real out-dated "swivel-eyed loons" get away with shouting barely comprehensible social ideas from the rooftops over gay marriage, immigration and the EU, tbg caught up with Former Tory Youth Leader Ben Howlett for his opinions on recent headlines and his activities since retiring as Tory Youth Leader. Howlett also has some advice for his successor. "Special K, Oats and Honey." Are you a swivel-eyed loon or do you know of any in Tory ranks? "Let’s be absolutely clear, Conservative Party activists and Conservative Future activists are the lifeblood of our party. If it was not for hardworking CF and party volunteers the leaflets would not get delivered, no money would be raised and we would quickly lose Councillors, Mayors and Members of Parliament. "Over 3 years at the helm of Conservative Future the National Executives and I ensured the Party recognised the hard work of activists. Lord Feldman has been a massive supporter and friend of Conservative Future over the last 3 years. If it was not for him CF members would not have had an increase in the budget made available to us, a reception at No.10, continuing free Fresher’s Kits, a platform at National Conference and a return of CF National Conference. "Loyalty is sometimes lost in politics and the recent innuendo in the press should be condemned." How do you view the attitude in the Conservative Party towards gay marriage? "I am a firm believer in the changes coming before the House this week. I believe the vast majority of young people in the party are firm supporters of the legislation and I very much hope the new CF National Executive will continue supporting the proposals as they enter this critical stage. "While I recognise this is a matter of conscience for Members of Parliament, I hope the silent majority of members will contact their MPs and help them make an informed decision on the matter. Any proposal to delay this matter will result in it becoming an issue in 2015. "This issue can have a line drawn under it in time for us to concentrate on our excellent record on cutting the deficit, increasing private sector jobs, controlling immigration and creating a world class education system. Let’s not start playing politics when the issue received overwhelming support in the House." What have you been up to since handing over the reigns of power to the new Tory Youth Chairman? "I have been getting back to the gym largely. Josh and I are moving in with each other in South West London and we intend to help with the local campaigns there. "I continue to work with the NHS at my company ensuring hospitals can make savings in the back office to divert to the frontline. "I have also been supporting Syed Kamall MEP as one of our soundest MEPs as he goes through re-selection. I want to see more Eurosceptic champions get selected as MEPs across the UK. Our relationship needs changing and people like Syed do so much to champion Londoners and Britain." Do you sometimes get embarrassed by certain Tory MP’s, or do you blame their Associations as they tend to do? "I wouldn’t say embarrassed, some MPs and members must remember that there is a larger picture out there and we need to concentrate on forming an overall majority. The more we attack ourselves, the more we undermine that effort. "Red Ed is not connecting with the public, the Prime Minister is still well ahead of Labour and the Lib Dems on the economy and by historical standards, if they are to win, Labour should be much further ahead mid-term than they are now. If we are to win in 2015 we must take the fight to Labour and ensure we have a positive long-term narrative to win an overall majority. "I believe that core Conservative value of aspiration must underpin our long-term efforts in the future. Like most of your readers my parents never went to university and my dad worked for his dad in the bike shop. As a result of Thatcher’s policies in the 1980s they worked hard to get my brother and I where we are now. "This message of 'Conservatives want the best for your family and children in the future' is something that must underpin our messaging in the future. I believe that message will inspire millions more young and old to vote Conservative in 2015." "Shake it all about! I want to ensure the Prime Minister now sets out an agenda of what powers he wants to renegotiate from the European Union by 2017. "As it stands we know that we are the only party offering a referendum in 2017, but we don’t know what powers the PM will have transferred back into UK control. "I doubt the public would be too supportive if we only get control of our Fisheries Policy again. We want to see Britain’s relationship being one of largely trade, not politics. "I think Britain has a strong hand on the negotiation table to get powers back while allowing France and Germany what they want. I just hope the PM will use the same clout as he did when he became the first Prime Minister in history to use the veto." Do you have any advice to your Successor as Tory Youth Leader? "My main advice would be to never forget that Conservative Future is a broad-church of opinion, all members must have their voices heard. The new National Executive have a great platform to take the organisation forwards. "Membership was up under my two terms, I hope they get even more in associations and on campuses this year. I hope there are some more fantastic events with great speakers and that campaigns are getting underway in our target seats in 2014 and 2015. "The most important thing that I hope they continue to say is 'thank you' to members across the country for their hard work and dedication. It is a truly winning formula and I wish them the best of luck." Howlett is NOT allowed to use the word "soundest". That's OUR word. Very nice piece, Ben, you shall be missed! Why is he still here? Get out of the bubble. I really hope Ben Howlett gets a safe seat. I never thought I would say this but I really am beginning to miss Chairman Howe. Unlike Colonel Cooper you know where you stood with him. He engaged with the membership (not just on twitter) and let everyone know what his plans were and how CF would achieve it. Still very few words or action plans from Oily that I can note. If it continues like this for much longer even more people will become disconected from the national picture and the regions will become ever more isolated. @ 9:37 - is it possible to instigate a vote of 'no confidence' in Cooper's leadership? If CF is a democratic institution, there must be some mechanism for this. he just met Cooper and Harley? Not keen on having that comment attributed to you? Coward. Mentioned in the same sentence as two successive Chairmen of C.F. If that's supposed to be an insult then you'll have to try harder.